ST. LOUIS, January 06, 2015 – Today the St. Louis Cardinals announced the schedule for the team’s 2015 Cardinals Caravan, presented by Missouri Farm Bureau Insurance. 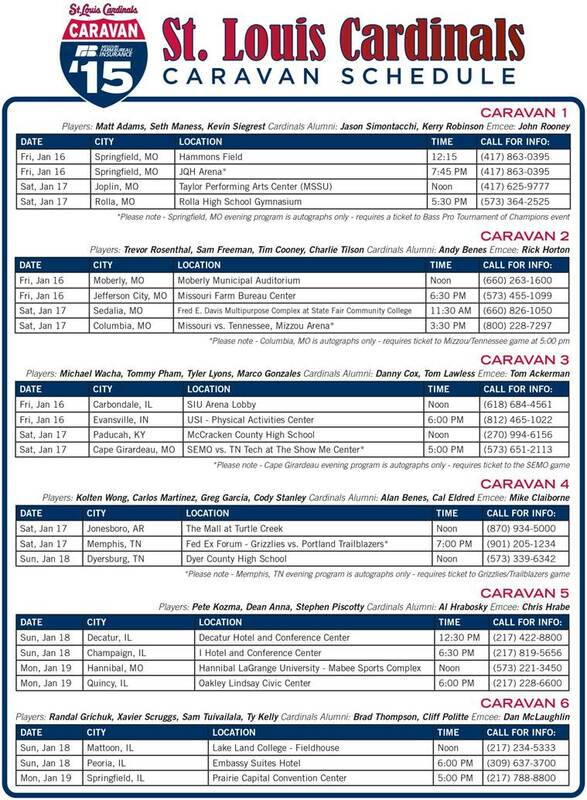 In addition to annual stops in Missouri, Illinois, Arkansas, and Tennessee, the 2015 Caravan will add a sixth route with additional stops in Kentucky and Indiana. Altogether, more than 30 current and former players will embark on the journey making 22 stops in 21 cities throughout Cardinals Nation fromJanuary 16 – 19th. A combination of current players, future stars and former Cardinals will travel on each caravan emceed by a current team broadcaster. Some of the current players include 2014 Rookie of the Year finalist Kolten Wong, Michael Wacha, Matt Adams, Carlos Martinez, Trevor Rosenthal, 2014 Minor League Pitcher of the Year Marco Gonzales, and Randal Grichuk. Minor-league prospects include Stephen Piscotty, Greg Garcia, Tim Cooney, Xavier Scruggs and more. Brad Thompson, Danny Cox, Kerry Robinson, Alan and Andy Benes, and Al Hrabosky, among others, will represent Cardinals Alumni, while broadcasters John Rooney, Rick Horton, Mike Claiborne, Tom Ackerman, Chris Hrabe, and Dan McLaughlin will serve as emcees. Team mascot Fredbird will also make an appearance at several Caravan stops. As in previous years, the Cardinals will be implementing an Autograph Ticket system at each stop. The first 400 kids (15 and under) through the door on the day of the event will receive a free Autograph Ticket which guarantees one autograph from each current and former player. Due to high demand, autographs will only be available for fans 15 and under. Below is a schedule of the six Caravans, their destinations and participating players. The full schedule can also be found at cardinals.com/caravan.